I don’t know about you but when I get a craving for something, the feeling nags at me until I satisfy it. Who wants to spend forever cooking when you are ready to stuff your face though?! For that matter who wants to spend forever cleaning up once said face is stuffed? Luckily this super easy Southwest Steak And Eggs Skillet is perfect for mornings when you have all the desire to eat, but with very little adulting required. When you make this recipe I HIGHLY encourage you to use a cast iron skillet. Yes you can make it in an ovenproof skillet, but cast iron is great for getting a solid sear on meat. Plus cast iron really retains heat so your food will stay warm longer. We typically plop the skillet in the middle of the table and let folks serve themselves family style. The portions are pretty large so this recipe can feed from 4-6 people. Just up the amount of eggs so you have one per person. My favorite part of this skillet is you can customize it how you want with delicious toppings! Like a little ketchup on your hash browns? How about some salsa and sour cream? You could even go to the opposite extreme. Just drizzle a little maple syrup on top for a sweet and spicy combo. 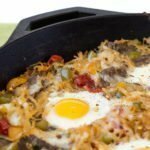 Random note – If you are craving breakfast for dinner then this Southwest Steak And Eggs Skillet is great for quick weeknight meals too! 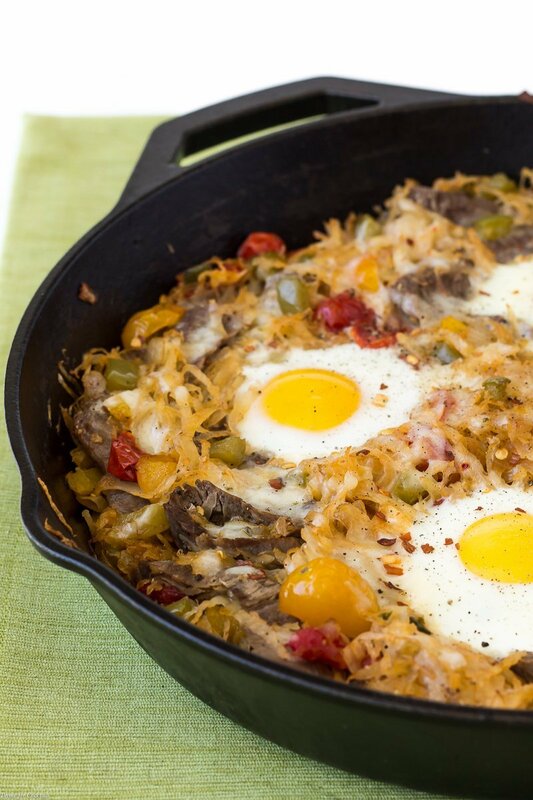 I hope you like this Southwest Steak And Eggs Skillet as much as my crew does. If you love this easy 10-ingredient skillet recipe, you can find more like it by checking out my Skillet Meals section! For recipe inspiration delivered to your inbox, subscribe to my newsletter, follow my photography journey on Instagram, and for generally inappropriate humor follow like me on Facebook! 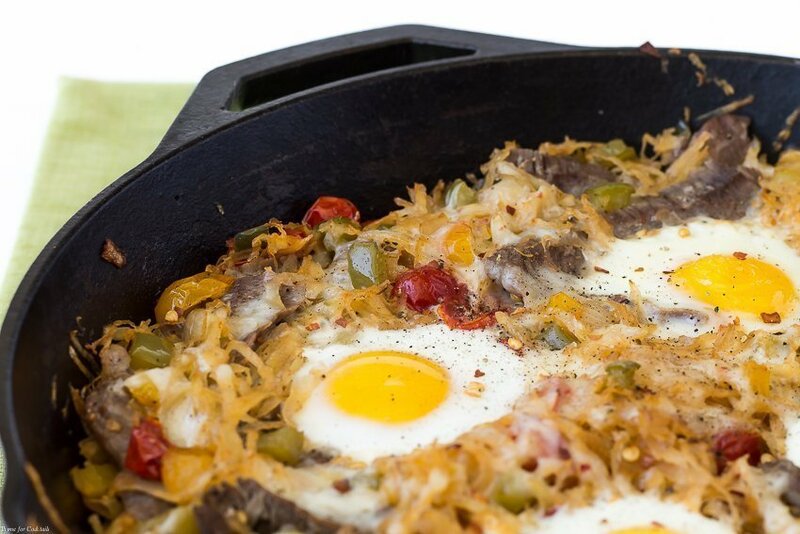 Easy breakfast skillet made with steak, cheesy hash browns, onions, peppers, tomatoes, and baked with eggs. Heat oil in a large cast iron or oven safe skillet over medium heat. Light season steak with salt and pepper. Add to skillet and sear 1 minute on each side. Set aside on a plate to rest. Add tomatoes, onion, peppers, and garlic to skillet. Sauté 3-4 minutes until slight soft. Mix in hash browns, cook 5-7 minutes stirring occasionally. Thinly slice steak and return to skillet, stir on combine. Sprinkle with cheese. Use a spoon to make small wells in the hash brown mixture. Crack eggs into wells. Bake 8-10 minutes or until eggs reach desired doneness. Tip- Working one at a time it helps to crack eggs into a small bowl first, then pour them into the wells.